Stay informed with the events we sponsor! For IMMOMIG AG it is important that its customers are always informed about the latest trends on the real estate market and at the same time have the opportunity to expand their network. It is a matter of honour for IMMOMIG AG to sponsor many events in the real estate sector throughout the year. As a popular topic, it is also the same topic "digitization" that was discussed on Brokers' Day on 16 November in Lausanne. However, USPI Vaud has focused more on the presentation of various IT tools that can make your work easier! A legal and SEO part rounded off this wonderful day. 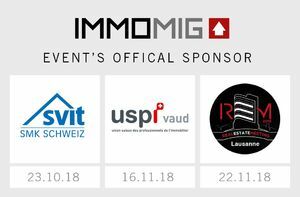 Lastly, on 22 November, the traditional day on the shore and on Lake Geneva was organized by the REM team and sponsored by IMMOMIG AG. This event, which focuses on innovations and new technologies, started with a conference and continued with a boat trip. It was an opportunity for a good exchange between many important players in the real estate industry. If you would also like to participate in the events we sponsor, please visit our events page regularly and register when the time comes!